Please click on the question of your choice to see the answer. What are Dr. Miller’s fees and office policies? Please call the office at 1-800-528-2737 or 530-478-1807 and we would be happy to discuss the fees and office policies. What kind of doctor is Dr. Miller? 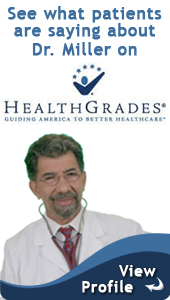 Dr. Miller is a traditionally trained physician, a M.D. (Medical Doctor), a graduate of The Albert Einstein College of Medicine in New York City. His medical practice is focused primarily on his subspecialty, Mind-Body Medicine, an approach to human health that focuses on healing and wholeness at the systemic level. After my initial two-hour visit, how long will Dr. Miller want my appointments to be? You and Dr. Miller, together, will decide on the length and frequency of your appointments. He prefers that the first one or two appointments be two hours in length. Additional appointments, when needed, are sometimes this length, but are most often one hour in length at intervals of one to four weeks. The particular issue or problem being dealt with generally has a major effect on the amount of time needed for each visit; some appointments may be as short as 15 minutes. What kind of issues does Dr. Miller handle? With more than 30 years experience, Dr. Miller handles a wide variety of situations ranging from chronic physical or emotional problems to physical disorders and psychological issues. Appointments may be for psychological issues, including mood disorders (anxiety, depression, anger, shyness, panic, OCD, etc. ), ADD, couples counseling, bereavement, pain, physical issues (headache, chronic fatigue, high blood pressure, cancer, sexual dysfunction, etc. ), and behavioral disorders (smoking, weight issues, alcohol or drug abuse, OCD, procrastination, poor performance), and other maladaptive patterns. Most of his patients and clients are adults, although he often sees adolescents, and sometimes younger children. Can Dr. Miller make me a personalized meditation tape? Is there an extra charge for this? Yes and there is no extra charge. Dr. Miller can incorporate any scenes, images, colors, sounds, etc. that work well for you into a recording. Dr. Miller regularly records portions of sessions. If you are seen by phone or Skype then either a tape will be mailed to you within the week or an MP3 file can be emailed to you. Learn more about the recordings Dr. Miller makes for patients and clients . . . This will vary depending upon your unique illness or dysfunction. Often, only brief work is needed. This might consist of one to 10 sessions in the office, by phone, or Internet. Sometimes much more intensive work over a longer period is advisable. A more accurate estimate can be given after one to three appointments, when your response to treatment can be evaluated. Following this initial series, consultation by phone, in office, or by Internet may be recommended at intervals of one to three months, or even yearly, according to your needs. I’m not sure if the appointment time you quoted me will fit into my schedule. What should I do? Can you hold it for me until I can call you back? Because Dr. Miller’s time is very limited, we cannot hold an appointment time for more than a few hours, or a day. Call back as soon as possible. Can Dr. Miller prescribe medication? Does he? Yes, when indicated, medications such as antidepressants, antianxiety agents, mood stabilizers, and stimulants (as in the treatment of ADHD) are used very carefully and judiciously. Intense emotional states, especially when prolonged for days, weeks, and even months, tend to produce physical damage to the membranes of the neurons of the brain and nervous system. Medications can control such symptoms and prevent further damage while the brain heals itself. They are generally seen as temporary aids and are gradually withdrawn as soon as possible to minimize metabolic load and side effects. Does Dr. Miller perform physical exams? Dr. Miller does not routinely do complete physical exams beyond, perhaps, an observation of any specific illness or dysfunction that is part of your reason for the visit. It is expected that you will receive general medical treatment by your Primary Care Practitioner (PCP) in addition to any help you get from your visits to Dr. Miller and working with the recordings he recommends for you. If you feel that your condition warrants a physical exam, it is best to obtain this first from your PCP, and bring any lab tests or other results to your first appointment. Are phone sessions conducted the same as in-office sessions? Yes. The only difference is that your receipt and session recordings are mailed to you within the week of your appointment or emailed to you. Patients need to be seen in the office at least once, preferably on their first appointment, although this may be postponed to a later visit when advisable. Do phone and Skype sessions cost the same as in-office sessions? Yes. If you have a phone or Skype session, and if a recording has been made of some or all of it, a copy will be mailed or, preferably, emailed to you immediately. How do I schedule an appointment with Dr. Miller? You can call the office to schedule an appointment right away or talk with someone to get more questions answered. Or, you can email us to ask your questions, or give us your name and phone number and the most convenient time for someone to call you back. To get started right away, go to the links here and start filling out the New Patient forms. You can send them to us by email or FAX to 530-478-0160. Ready to schedule your appointment with Dr. Miller? Still have unanswered questions? Send us an email.